Happy On the Way.com: Fatt Chatt: Session I. Bad Suz: I'm so fat. My arms are floppy. My stomach's mushy. I'm so fat. Good Suz: Well I don't know what else you expect to be! 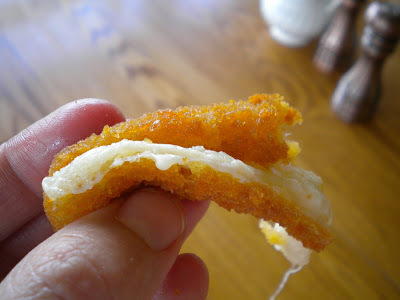 THINK of HOW MANY fried mozzarella cheesesticks you ate yesterday...AFTER DINNER! What are you complaining about? You eat everything in sight! Good Suz: "...and those cheesesticks weren't even YOURS! They belonged to Lisa. You were just storing them for her! And you ate them! ATROCIOUS! Bad Suz: I figured I'd pay her for them, and you know she'd give them to me post-digestively anyway because she's nice...unlike YOU. Good Suz: You want to know why you don't fit into your summer clothes, and I'm just telling you. Dairy products. And don't even get me started on that lo mien fiasco at the mall today. Bad Suz: Ha! I earned every noodle shopping with three teens and a toddler! Every bite! And anyway, I only ate a fraction of what they ate! And I HAD to eat the chocolate mocha truffle because Katie BOUGHT it for ME! ...mother daughter bonding. Good Suz: Fat cells bonding to your thighs!!! And did I even mention the truffle?....the HUGE sugar and fat filled truffle...with the latte? Bad Suz: (groan) You are no help. Suzanne, I'm SPEECHLESS! And I'm on my over right now to make you walk two miles with me as penance! Oh...I want in..first the cheese sticks and then the walk...I have very similar discussions on a regular basis! Sigh. You are hilarious. I so look forward to all your blog posts. I love your honesty and humor, Suzanne! I suppose I also like reading that I'm not the only one dealing with unhealthy eating and chaos in their day! Thank you Dana. Good Suzanne agrees with you (about the not fat part) but bad Suzanne is disgruntled that she can't wear her favorite clothes. Ah well. THanks for your sweet comment. Suzanne, your writing is awesome. And then the fact that you included a picture of you eating the cheese sticks. Love it!